(Newser) – On Wednesday afternoon California residents were shocked to learn that a powerful earthquake had supposedly hit the Pacific Ocean about 10 miles off the coast of Santa Barbara. They were probably just as surprised to learn a few minutes later that the magnitude 6.8 quake had actually happened in 1925. The Los Angeles Times reports that a staffer at the California Institute of Technology mistakenly triggered an alert while correcting information about the location of the 92-year-old quake for the US Geological Survey's earthquake database. An email was then sent out from the USGS email server claiming that the 1925 quake was set to occur on June 29, 2025. The Washington Post reports that email alert automatically generated a story on the Times site through an algorithm called Quakebot. California destroyed? who cars. 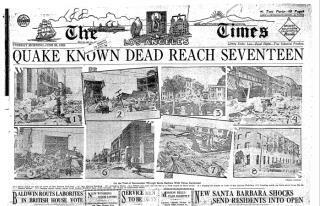 .Don't you mean "who cares"
Earthquake in '25, eh? Uh, is that 2025 or 1925?